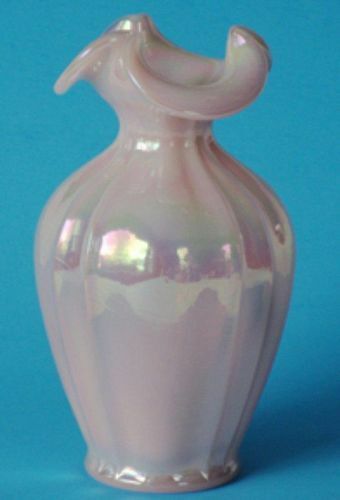 Fenton made this Pink Shell Irridized 8" Vase in the 1980's. It is in mint condition. 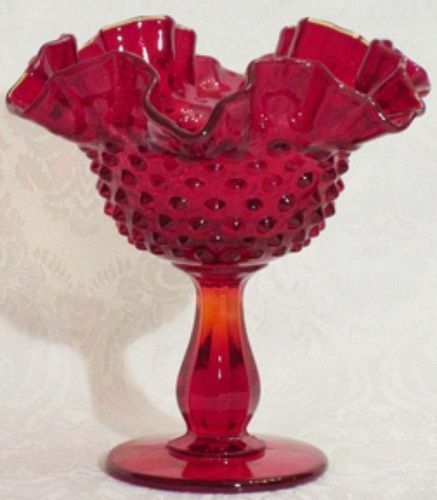 Fenton made this red Hobnail Comport in the 1960's. It is 6" tall and about 6.5" wide. In mint condition. 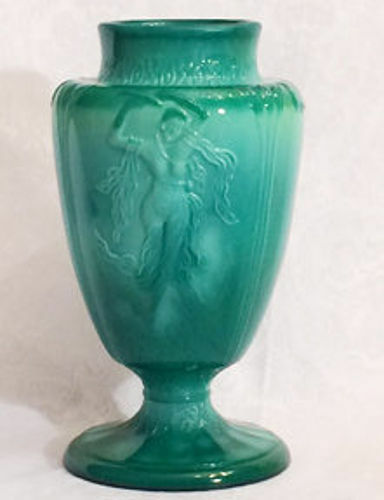 This Fenton vase is about 8.5" tall. 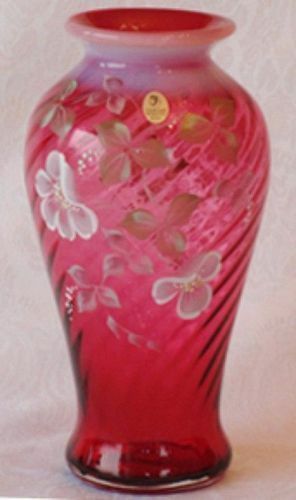 This vase is triple cased! Ruby inside over a very thin layer of white milk glass, with dusty rose and crested in royal blue, henceforth, Dusty Rose/Black Rose. It is in mint condition. 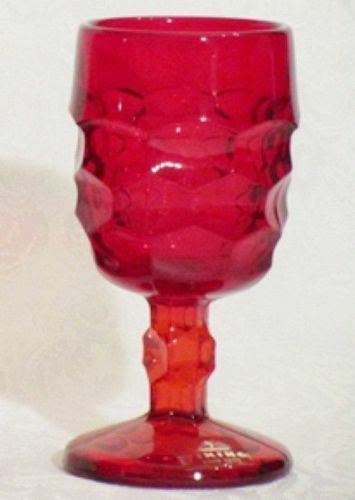 Viking Red Georgian Wine Goblet, 5 oz. Viking made the pattern Georgian in the 1960's. 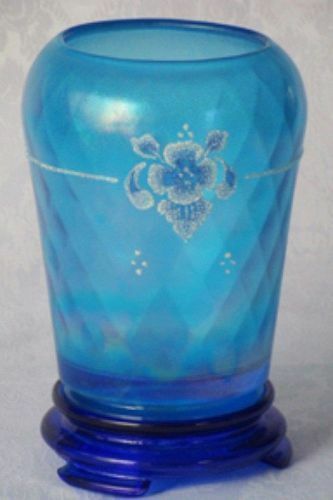 Most still have the clear cellophane label -- never used! This is the 5 oz. 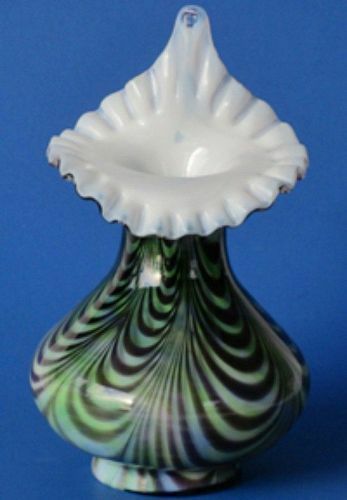 small goblet, 5" tall. Four are available. 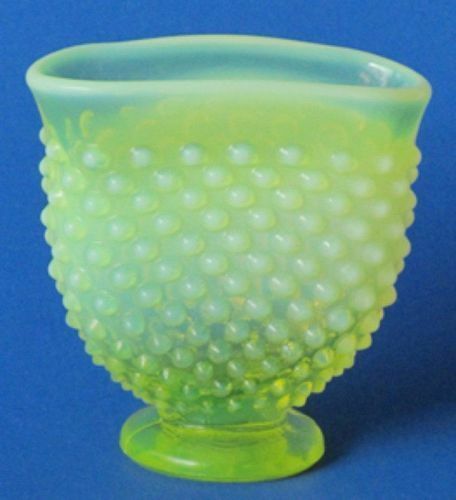 Fenton made this Topaz (vaseline opalescent) Mini Hobnail Fan Vase in the 1950's. 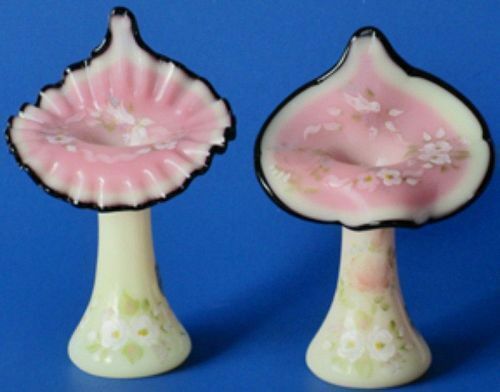 It is 3.5" tall and in mint condition. 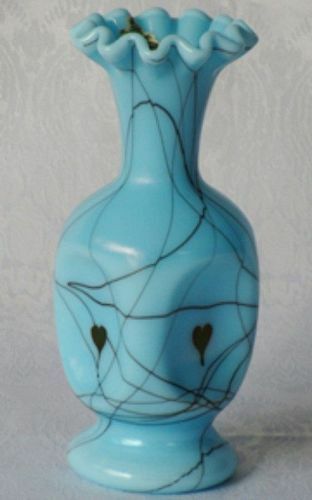 Fenton Turquoise Hanging Heart 7.25" Vase (squared and pinched) was designed by Robert Barber in 1976. Still has the original paper gold label and is in mint condition. Also, logo embossed on bottom. 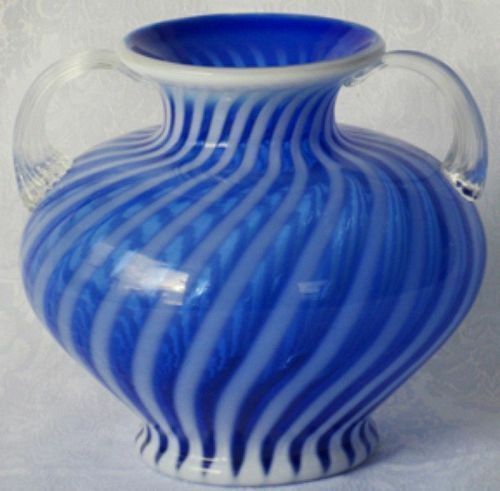 As part of Fenton 1990 Connoisseur Collection, this 7" tall pitcher is number 897/1500. In mint condition. 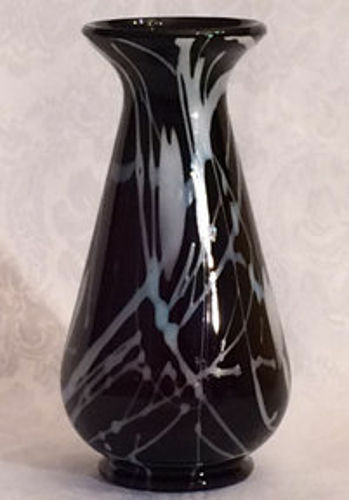 Fenton made this French Royale Swirl Connoisseur Collection Vase in the 1980's. 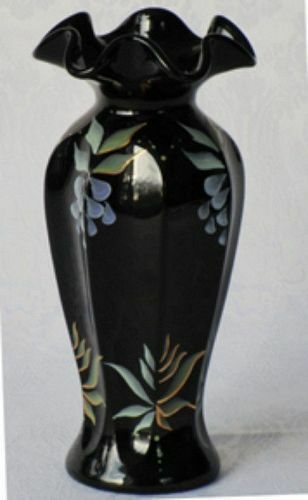 The vase is about 7.5" tall and 8" at its widest. In mint condition with paper certificate. Numbered: 66 of 1,000 made. 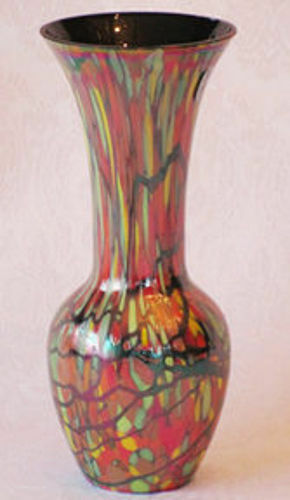 Fenton made this hand-painted Spiral Optic 10" Vase in the 1980's. It is in mint condition. 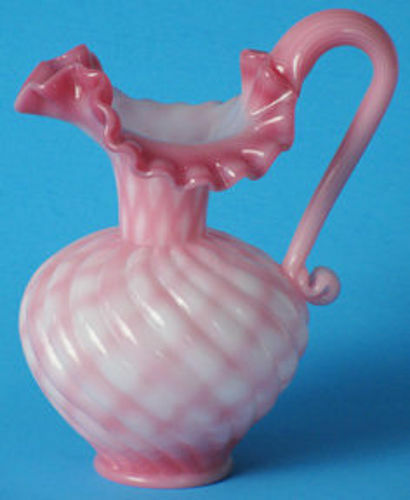 Fenton made the straw vase in many, many colors. 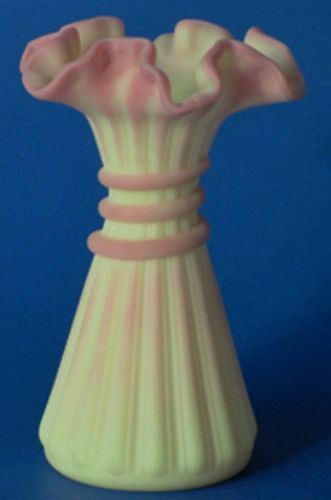 This Burmese straw vase is about 7" tall and is in mint condition. 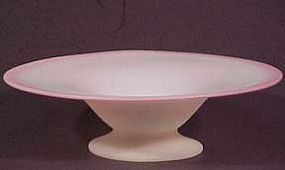 This Stueben made art bowl is about 5.5" wide, and about 1.25" tall. It is in mint condition. 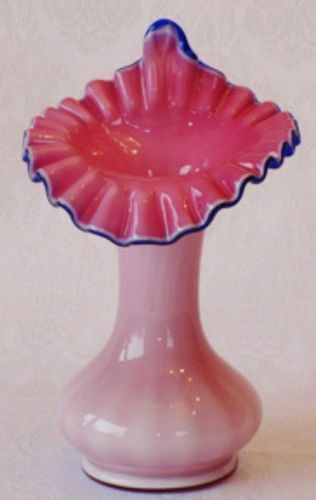 The color is bluish and blushes to cranberry at the edges.